When I was 20, I worked as a nanny in the outskirts of Baltimore. While there, the mother of the family insisted I watch 2 videos, both of which I had never seen before. One was the birth of her first child, and the other, The Wizard of Oz. Now, I know what you’re thinking: “What! You’d never seen the Wizard of Oz? !” It’s true, until then I never had. At least, I’d never seen the 1939 Hollywood film. I had seen an amateur dramatic version when I was 6; the performance of which proved unforgettable, not for its inherent brilliance, but because the fellow playing the lion had a heart attack on stage and died. 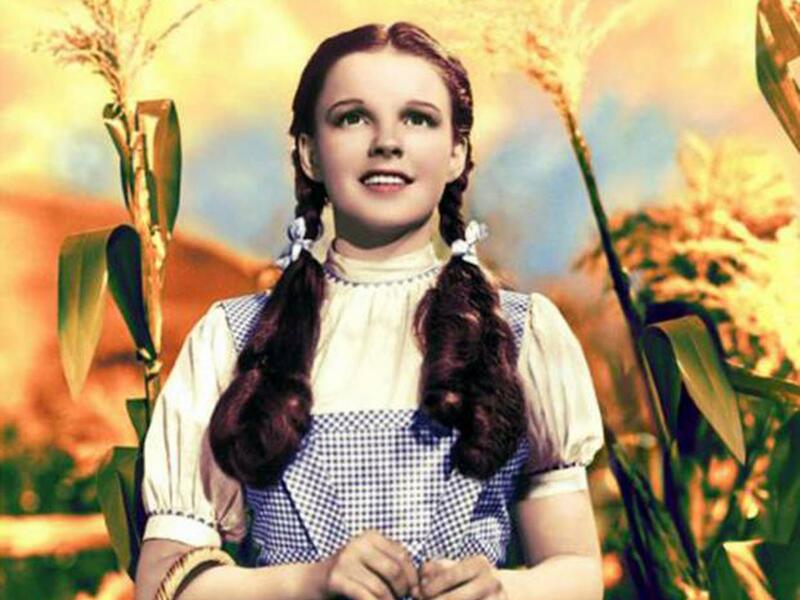 Although the movie version of the Wizard of Oz made less of a psychic impact than the death in the theatre one – and certainly wasn’t as astonishing as the birthing video – it was easy to see why, for more than 80 years, the world has been mesmerized by a gingham clad girl and costumed, middle-aged men skipping through a Technicolor stage set. It’s a fabulous movie, one that has only increased in popularity during the years. Based on the much-loved children’s story by L. Frank Baum, MGM bought the film rights in 1939 and created an award winning, most watched movie of all time. Without doubt, the key element of its success was the star of the movie, Judy Garland (1922-69). Judy was MGM’s 3rd choice for the role of Dorothy Gale. Their first was the irrepressibly cute Shirley Temple, but she belonged to another studio which refused to release her. Deanna Durbin was next on the list, but she was busy doing this or that. So, MGM turned their attentions to Judy; although she belonged (and I mean, literally belonged) to MGM, she was 16 and flush with pubescent glory, so was considered too old for the part. In her favor was the fact that she was 4′-11″, so with a baby doll hair-do and bosom flattening corset, the powers at be conceded that she looked suitably childlike and gave Judy the role that would make her a legend. Really it was a piece of accidental genius on MGM’s part, for it was precisely because the character of Dorothy hovers in the nether world between childhood and womanhood, that the movie is so compelling to both children and adults alike. Judy had been signed to MGM 3 years earlier, after studio head, Louis B. Mayer, heard her sing. With a background in Vaudeville Theatre, Judy – or Frances Gumm as she was born – had been performing from the age of 3, as part of a triple act with her two older sisters – aptly named, The Gumm Sisters. Baby Gumm, as she was affectionately termed, made her stage debut with a rendition of Jingle Bells; she loved the experience so much that she kept right on singing until her father carried her off the stage. So began her love of performance, which made her a natural. Her exceptional gift was evident to all her saw her perform, and was described as a force-field round her; add 1 stage mother and Hollywood’s penchant for musicals, and you had a recipe for stardom. Her voice was by far her greatest asset; it created a world of delicious sound that enveloped the listener and delighted the ear, even to this day. She said of singing herself, that she liked to play with a song and explore it. There was, and still is, no other sound like it in the world. Arguably, its finest incarnation is in the opening sequence of The Wizard of Oz; the song, of course, is Somewhere Over the Rainbow. I defy anyone to find a more exquisite sound. Unfortunately, with great talent comes great responsibility: i.e. the responsibility of protecting it. I say unfortunately, because in Judy’s case, her talent fell into the hands of the early Hollywood mega-factory MGM. While it is true that MGM provided a vehicle by which Judy’s talent was given to the world, preserving aspects of it for posterity; it is equally true that MGM ruthlessly exploited her and played a key role in the internal suffering that plagued her life and led ultimately to her destruction. Early photos attest to the fact that Judy was beautiful – in a knitting pattern model kind of way. Unfortunately, such beauty was not thought to be a money-maker in Hollywood and, therefore, was not revered. Judy was made painfully aware of this fact and it is well known she suffered terrible insecurity about her looks all her life. She felt like the ugly duckling next to her ‘Hollywood beautiful’ – if less talented – co-stars. Her insecurity was compounded by the fact that MGM made her wear a prosthetic nose and caps on her teeth and deliberately restricted her food intake. Still, her gift made her a box office hit; so, to ensure their cash-cow produced a maximum yield, MGM set Judy a punishing schedule of up to 4 movies a year; which meant rehearsing for one while still filming another. Yip Harberg – lyrist for Over the Rainbow – made the astute observation that making a movie is grueling and can be devastating on the nervous system. This being so, it is no surprise that Judy – already highly-strung and sensitive – buckled under her extreme workload. Suffering from insomnia and an inability to switch-off at the end of the day, Judy was prescribed barbiturates to help her sleep. To counteract their narcotic effect and to enable her to carry on working past exhaustion, she was simultaneously prescribed Benzedrine (aka amphetamines). Sadly, her use of these powerful drugs spiraled into abuse and addiction and were the cause her premature death from an accidental overdose at 47. Not only did her drug use rob her of her piece of mind and eventually cause her death, it also severely hampered her ability to work. After 15 years and 29 movies, Judy was dropped from MGM, due to her erratic behavior, constant lateness or failure to turn up at all. In less than 48 hours after being dumped by the studio – which, by this time, saw her as an embarrassment and a nuisance, but which had been her entire life, and to which she had given so much – Judy tried kill herself (the first of numerous attempts throughout her life) by cutting her throat. Broken and unemployable, her movie career was over. She was 28 years old. Judy’s story did not end there. She rose from the ashes and returned to her roots, the stage. She was, in her own words, reborn. In the space of 19 years she performed in 1100 concerts, 30 TV shows, 4 movies, 13 records and, most importantly, had 3 children. Her personal life, which included 5 marriages, was also the stuff of legend. She battled extreme highs and lows – brought on by her continued drug use (whether she suffered organic psychological imbalance is beyond my knowledge); and suffered greatly because of it. However, her suffering did not define her in the eyes of those closest to her; rather, it was her sense of humor, generosity of spirit and her ability to express love that she is most remembered for. Her ability to express love was also what defined her as a stage performer. She claimed to genuinely love the people in her audience; that, for her, it was like a marriage. Like many marriages, that love was reciprocated. Some who attended her concerts describe them as the greatest experience of their lives. But even here her gift was exploited; for while she made some people very wealthy, she herself struggled financially and died virtually penniless. A rare recording of her singing Over the Rainbow later in life, expresses the full emotional weight of her statement above. The fact she is dressed as a Vaudeville clown only deepens the sense of anguish she communicates. She may have become Judy Garland, but deep down she was always Frances Gumm: an ordinary girl with an extraordinary gift. A gift that resonated deep within the human soul. A gift that enthralled audiences, made other people rich and ultimately destroyed her life. Hers was a gift that should have been treasured and treated with love and respect. Instead it was exploited, and used to satiate the greed of others. This is what we humans do when we envisage ways to make use of the gift of another. There exists a fine line between facilitating creative expression and exploiting it; a line we must be ever vigilant not to cross. We would also do well to remember that we are capable of exploiting ourselves. With our eyes firmly fixed on the prize, we can easily push ourselves beyond our ability to endure; damaging our gift – and ultimately ourselves – through unsustainable lifestyle choices that we believe to be shortcuts or props to production; or sell it to the highest bidder, even if it is to our detriment. I believe everybody’s life is filled will life-lessons we would all do well to heed; Judy Garland’s is no exception. One of the greatest, to be sure, is regarding exploitation, as discussed above; the other of course, is: Don’t Do Drugs!